ESPN is shuttering Grantland, and everyone on Twitter is sad. 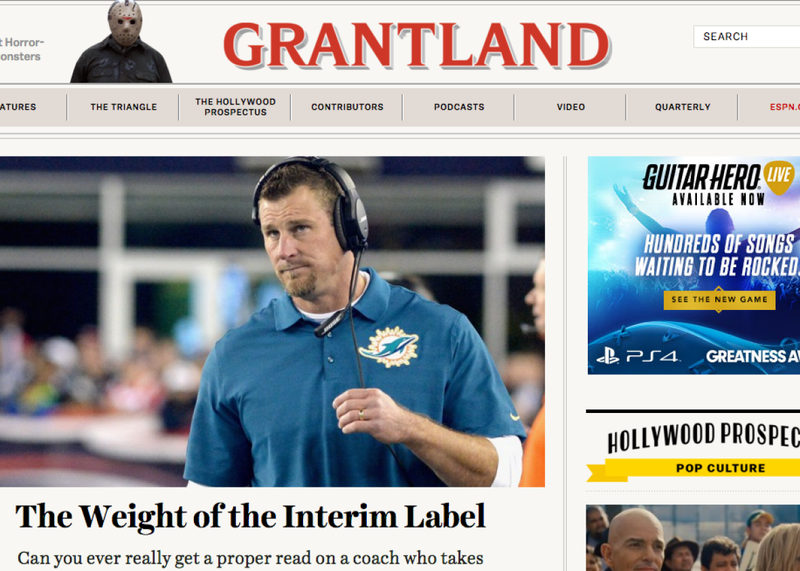 This is apparently Grantland’s final homepage. Excellent sports publication Grantland closed its doors suddenly on Friday, the site’s parent company ESPN announced. The status of the site had seemed to be up in the air ever since founding editor Bill Simmons’ departure from ESPN was announced in May, but even more so since earlier this month when it was reported that ESPN would be laying off about 300 employees. The site was one of the smartest on the Internet for longform sports journalism (and culture journalism) and was being lamented by journalists across the spectrum of areas of coverage on Twitter, from sports writers, to political writers, to culture writers. I'm the least guy-guy around. I don't like sports, cars, etc. Alice Munro is my favorite living writer. But even I liked Grantland. Ugh, Grantland too? There aren't enough 2nd graders in my kid's class to dress up as all of the dead publications for this year's Halloween. Says something about how much I loved Grantland that I'm more upset by it closing than the prospect of competing with its writers for work. Grantland was the home of some of my favourite writers. No disrespect to other ESPNers, but Grantland gave that place more of a soul. Killing Grantland right at the start of NBA season is like banning swimming pools at the start of summer. Cruel. While the site was clearly beloved by writers on the Internet, it was perhaps not loved widely enough among others for ESPN to consider it worth maintaining in a world where its founding editor no longer was working at the company and requiring of his own (excellent) vanity site. Whatever the reason for ESPN’s decision, it is a sad day for people who enjoy fun, smart, well-considered longform sports and culture journalism.